Join Sanctuary Yoga and Mindfulness for a relaxing fall-focused workshop. Here we are, well into fall and with the chill vibes of summer long in the rear-view mirror it’s likely that we could all use a friendly reminder to slow down and relax a little. A local yoga studio is hosting an “Autumnal Staycation” workshop to help us do just that. Sanctuary Yoga and Mindfulness in Midtown Village is welcoming participants to join them for a very special, self-care-filled tranquil staycation experience at their studio. “Float Into Fall: An Autumnal Staycation,” set for Saturday, October 27, from 2 to 4 p.m., will feature a candle-lit gentle movement, breath work and restorative poses — relaxing, long-held and supported resting poses with props — accompanied by healing essential oils and silk flax seed eye pillows. The workshop aims to inspire participants to rejuvenate their mind and body, after what always seems to be a momentous season, by calling upon many yogic practices to bring on the calm. That said, no prior yoga experience is required. "Our culture celebrates the intense workouts and of course, our studio offers these, but how about some radical self care? I am always talking about this, that we need to make "Radical Self Care" acts and this workshop was midwifed from that idea," explains Kilkenny Tremblay, owner of Sanctuary Yoga and Mindfulness. The studio hosts one workshop per season, because some yoga poses are more beneficial than others depending on the season. We asked Tremblay about the workshop: “Folks will be led through a sequence that supports 'Vatta' it's called in yoga, the element of 'wind' that is apparent in nature right now and affects us all. Yoga holds that the more grounded we can get right now, the more element of wind seems like a sweet breeze and won't blow us away. Stress, anxiety and depression are some of these 'winds' that present themselves in the fall and winter that can afflict us,” Tremblay says. 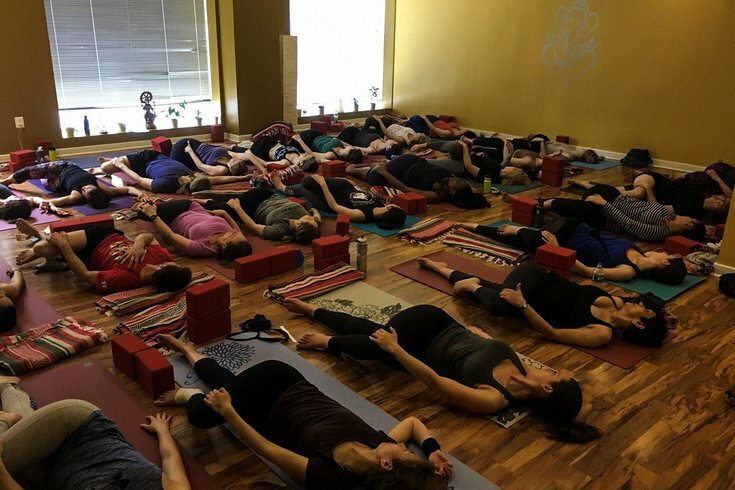 Sanctuary Yoga and Mindfulness is at 1233 Locust St. Tickets for the “Float Into Fall: An Autumnal Staycation” are $35 a pop, and you can grab yours here. Oh, and bonus: this event will wrap up with healthy snacks!